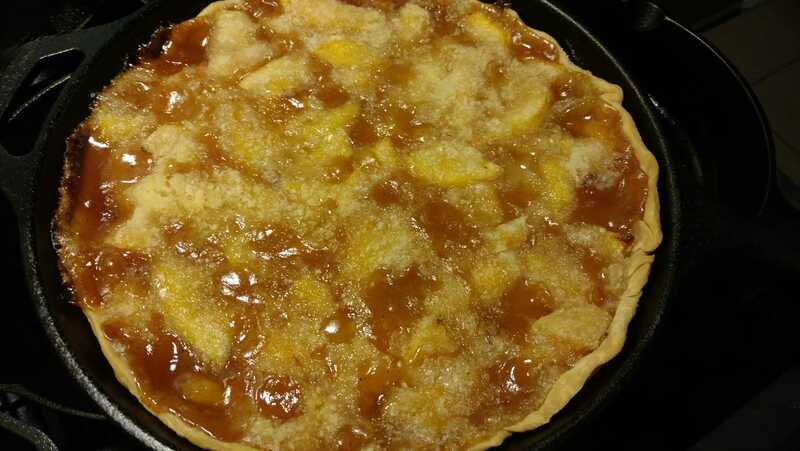 Pie crust, put in a 10 inch cast iron skillet. I had four softball size peaches. Peeled, slice and pit. quarter teaspoon almond flavoring, 1/2 cup sugar. Stir well. In food processor, blitz 2 tablespoons butter, 3/4 cup sugar, 1/3 cup flour. 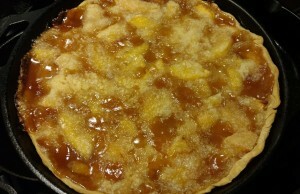 Pour peach mixture into shell, top with sugar mixture. Bake at 450 for 10 minutes, then reduce to 350 and bake another 40 minutes.